In late 70s US Army introduced MILES (Multiple Integrated Laser Engagement System) for realistic and cost effective training of soldiers in combat conditions. Despite the name, the system has nothing to do with laser. It consists of infra-red transmitters fitted on weapons and sensors fitted to targets (soldiers, vehicles, equipment). When a sensor is illuminated by infra-red beam, a hit is scored, and target eliminated/damaged. In mid 80s a simplified system appeared on civilian market, and over the years more advanced versions were introduced (of course the military MILES also received significant improvements). All modern lasertag systems are based on MILES and we offer one of the very best of them. If you enjoyed paintball or airsoft, you would love this game! 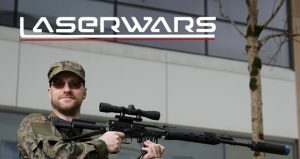 Lasertag is the solution for most of the problems with other outdoor wargames: it’s safe, clean and realistic. We offer lightweight weapons for women and children, as well as full size replicas for ‘big kids’ plus a lot of accessories to make the game more interesting, including: grenades, bombs, capture the flag, reloading points, and medic utility. Unlike paintball or airsoft it’s completely harmless and clean. Instead of plastic bullets or colour markers, it uses an infrared beam to tag sensors on your enemy’s headband. Perfect for: Scouts, Schools, Sports Clubs, Birthday Parties, Hen/Stag Parties, Field Days, Team Building and Summer Camps.